Perfect for commuting or camping, the Espro Coffee Travel Press allows you to brew excellent coffee directly in an insulated travel mug. Espro for deep, rich flavor only a coffee press provides. Enjoying great coffee in the Espro Coffee Travel Press is easy. Add coffee and hot water, wait 4 minutes, the press and enjoy. 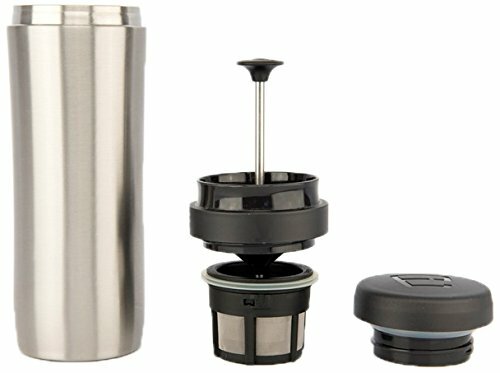 The Espro Travel Press Mug Includes: Vacuum insulated coffee press with coffee filter, drinking and travel lids. Volume: 10 oz. when used as a coffee press. 15 oz. when used as a travel mug. Just bought the new travel press for a 5 week cruise coming up next week. After a week of testing, I am thrilled to have "real" coffee taste, no grounds and easy to use. No more ships coffee which is basically made with syrup and undrinkable. I previously owned a Bodum, and there is no comparison. After the cruise, I plan on purchasing the 18oz press for home use.